Evening closes in over a somewhat buckled canoe, partially hauled out onto the banks of the St Mary's River in the town of Sherbrooke in Nova Scotia while nature performs above in the form of a beautiful sunset and dramatic cloud formations. 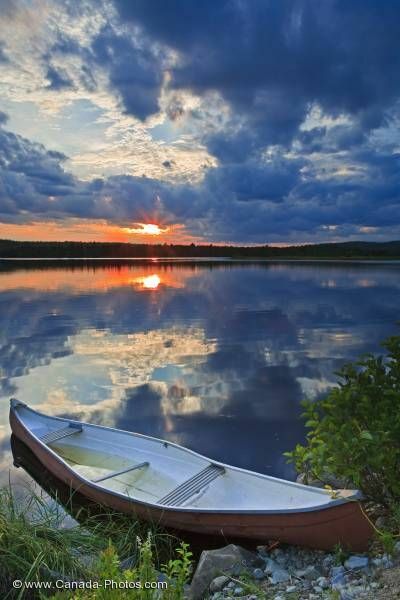 The water of the St Mary's River is calm as sunset lights the horizon and dramatic clouds form over a canoe which has been hauled out onto the banks of the river situated in the town of Sherbrooke, Nova Scotia. Canoe at sunset over the St Mary's River seen from the St Mary's Riverside Campground in the town of Sherbrooke along the Marine Drive, Highway 7, Nova Scotia, Canada.